So you have a thing for exposed bricks and luscious greens? Then you’d love what Distillery District has to offer for your wedding planning. After getting glammed up, we shot some lovely portrait photos with Rena and Ken, strolling around the Distillery. There was no shortage of red brick buildings with green metal framed windows, decked out by rustic lanterns and distressed wood panels. Especially with our luck getting a beautiful sunny day, this environment really brings out all the complementary colours and textures of a rustic style portrait session. What’s also conveniently tasteful for group portrait photos are the large-scale brick buildings that provide a very minimalistic, non-distractive backdrop to fit and frame groups of people. We love that even the ground was paved with square brick tiles, creating a seamless colour palette for the whole picture. Our lovely bride Rena has chosen a beautiful shade of pinkish lavender for her bridesmaids. We couldn’t get enough of the soft warm glow coming from this group! How cute are they with this cool wooden barrel as backdrop!? 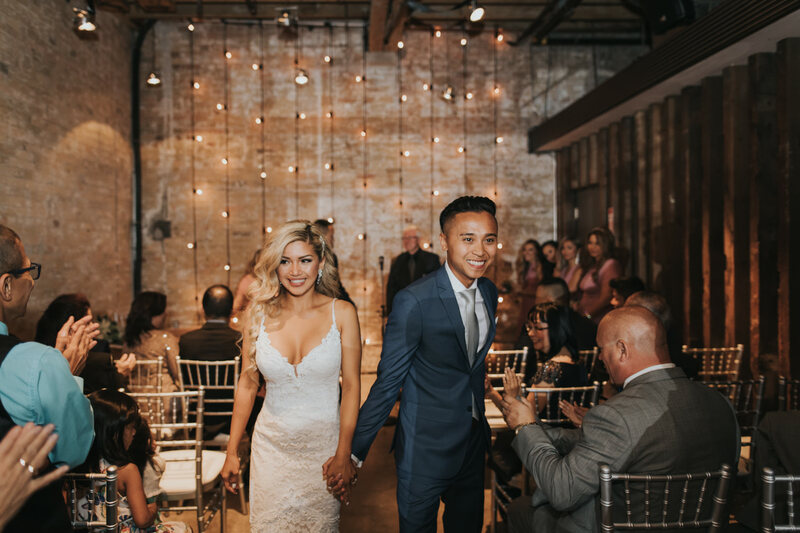 The indoor ceremony and reception at The Loft were consistent with the rustic theme. Located on the mezzanine level of the historic Boiler House, The Distillery District event venue is filled with wood panels and gold hardware accents throughout, decorated with soft, romantic string lights. Even the cupcake stand and cigar collection are matching with the theme! What an absolutely tasteful and intimate wedding, hope you enjoyed it! Get new wedding stories, beautiful tips and guides straight to your inbox! "We interviewed probably 18 photographers in Toronto in a span of a month, and couldn't find one that matched the classic yet modern aesthetic we wanted...of course, until we met Eric." - B.D. "It was 2 deg Celsius, raining, windy and our e-shoot pictures came out absolutely stunning! Eric made it such an enjoyable and memorable experience and we could not have asked for anything more!" - R.D. "Eric guided us throughout the entire process and made us feel very comfortable. His photos are so beautiful and romantic, he is truly gifted at making any environment work for gorgeous photos!" - R.A.